David Ospina has provided an update to his followers on social media after raising concern following a collision during Napoli’s clash with Udinese on Sunday. The 30-year-old suffered a head injury early on in the encounter, and had to be replaced just before half time after collapsing to the ground off the ball. 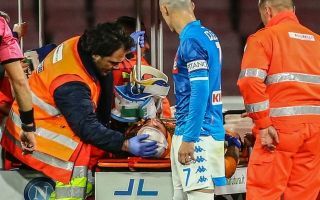 Concerning scenes followed as the Napoli players urged the medical team on the sidelines to get on the pitch, with Ospina being stretchered off and taken to hospital, as per BBC Sport. Napoli went on to win the game to strengthen their grip on second place in the Serie A table, but there was better news to come as Ospina posted an update on his health as seen below, as he assured his fans that he was recovering well and thanked them for their support. The message was accompanied by a wonderful image of him alongside his children, and it’s hoped that he now makes a swift and full recovery from his knock. The Colombian international is currently on a season-long loan deal at Napoli from Arsenal, and it remains to be seen whether or not he’ll return to the Emirates next year. With Petr Cech set to retire, Ospina could yet land another chance in north London to push Bernd Leno for a starting berth in Unai Emery’s starting line-up, but for now all concerned will just be relieved that he’s recovering well.